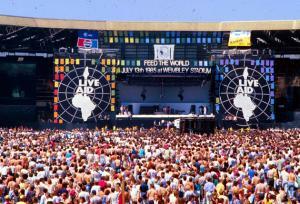 Live Aid millions spent on arms," headlines have said all over the world in the past few days after a year-long BBC investigation announced it had found evidence that millions of dollars earmarked for victims of the Ethiopian famine of 1984-85 went to buy weapons. It was, on the face of it, a highly damaging story which could undermine the extraordinary generosity of the public to give to the appeals launched whenever a major disaster strikes, as it has in Chile and Haiti in recent weeks. But examine the BBC report and it slips like sand through the fingers. What follows is the anatomy of a slur. The story, by the BBC World Service's Africa analyst, Martin Plaut, said that in 1985 the rebels of the Tigrean People's Liberation Front diverted 95 per cent of the aid sent to the north of Ethiopia into its fight to overthrow the government of the time. He quoted two senior rebel soldiers as saying that rebels had dressed up as merchants to trick aid agencies into handing over large amounts of cash, purportedly to buy food. To back up the claims he cited recently released CIA documents and quoted a senior US diplomat as saying that at the time they had believed that aid was "almost certainly being diverted for military purposes". It all sounds incredibly damning – until you ask who is making these allegations. The most senior rebel is Aregawi Berhe, once a commander in the rebel army. Or at least he was until the mid-80s when he fell out with the other leaders of the TPLF, most particularly with Meles Zenawi, the rebel who went on to become the Prime Minister of Ethiopia and who – revealingly enough – is facing a general election in Ethiopia next month. Aregawi fled to Holland, from where he has for years conducted vehement attacks on his erstwhile colleagues, Meles Zenawi in particular. "Not only did he defect under very political circumstances," said one Western aid monitor who spent years in Tigray at that time, "but he was in a different part of the country during much of this time." Indeed one partisan Ethiopian website has claimed, Aregawi left the TPLF before the clandestine cross-border import of food from Sudan even began. There are doubts about the good faith of the other rebel official quoted in the BBC story. Gebremedhin Araya was a senior figure in the TPLF's finance department. He was photographed dressed as a Muslim merchant counting the money after selling sacks of grain which were really, he said, filled with sand. But Gebremedhin too was purged by the TPLF and fled to exile in Australia.